This gracious home offers a lifetime of comfortable living in a contemporary plan. The great room, breakfast area, screened porch, and covered porch are pulled together for casual entertaining, while nine-foot ceilings on the first floor and a two-level foyer add to the spaciousness. French doors lead to the covered porch from the great room or from the master suite. Upstairs, columns accentuate the stunning balcony alcove. A bonus room with second floor access and plentiful attic storage add flexibility. 1st Floor: 1732 Sq. 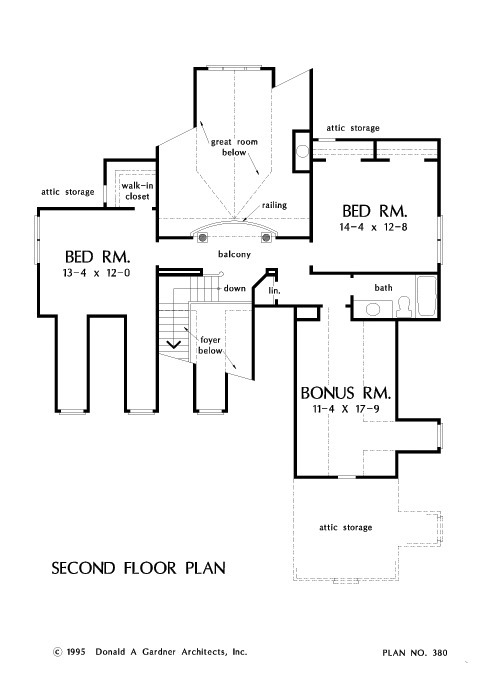 Ft.
2nd Floor: 758 Sq. Ft. Bonus Room: 242 Sq. Ft.
Porch - Screened: 186 Sq. 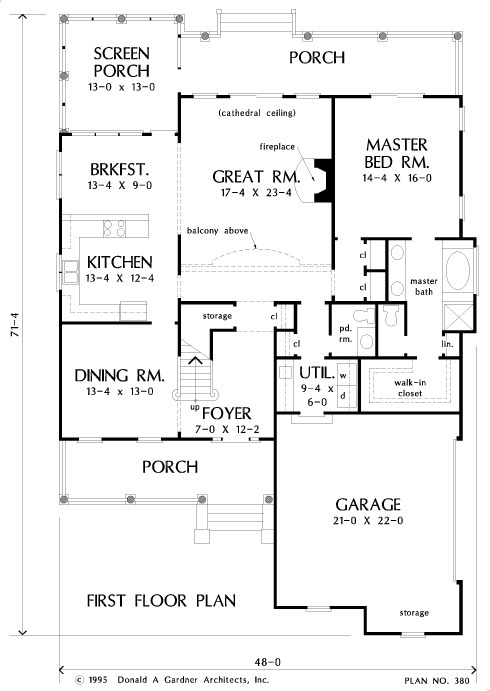 Ft.
House Dimensions: 48' 0" x 71' 4"
Great Room: 17' 4" x 23' 4"
Bonus Room : 11' 4" x 17' 9" x 8' 0"
Garage Storage : 10' 8" x 3' 0" x 0' 0"
Master Bedroom : 14' 4" x 16' 0" x 9' 0"
Bedroom #3 : 14' 4" x 12' 8" x 8' 0"
Porch - Front : 24' 8" x 7' 4" x 0' 0"
Porch - Rear : 32' 8" x 7' 4" x 0' 0"
Porch - Screen : 13' 0" x 13' 0" x 0' 0"
Balcony : 9' 6" x 5' 5" x 8' 0"
Storage (1st Fl.) 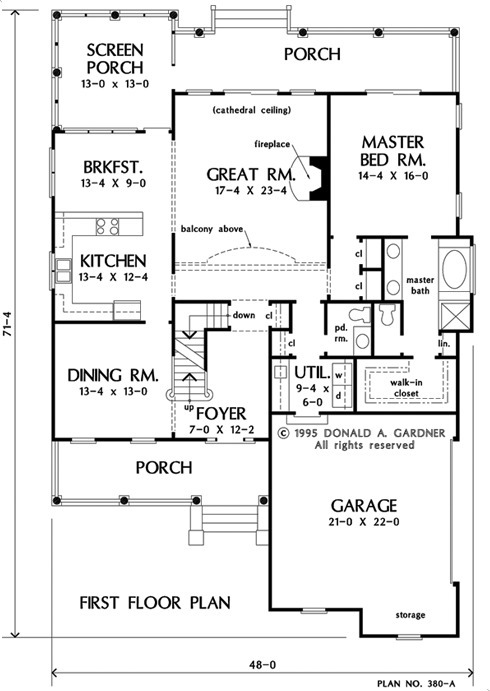 : 6' 1" x 2' 10" x 0' 0"
Foyer (Vaulted): 7' 0" x 12' 2" x 18' 2"
Dining Room : 13' 4" x 13' 0" x 9' 0"
Great Room (Cathedral): 17' 4" x 23' 4" x 22' 3"
Breakfast Room : 13' 4" x 9' 0" x 9' 0"